The Conservation & Science team at the Monterey Bay Aquarium has worked for more than two decades to understand and recover bluefin tuna populations – particularly Pacific bluefin tuna, whose population has declined historically due to overfishing. A key piece of our efforts is tagging bluefin tuna in the wild so we can document their migrations across ocean basins. Much of our work takes place in the Eastern Pacific, but this month we’re partnering with Japanese colleagues to tag bluefin tuna in the Sea of Japan. Tuna Research and Conservation Center Research Technician Ethan Estess, working with Program Manager Chuck Farwell, is chronicling his experience in the field. This the first dispatch in his series. 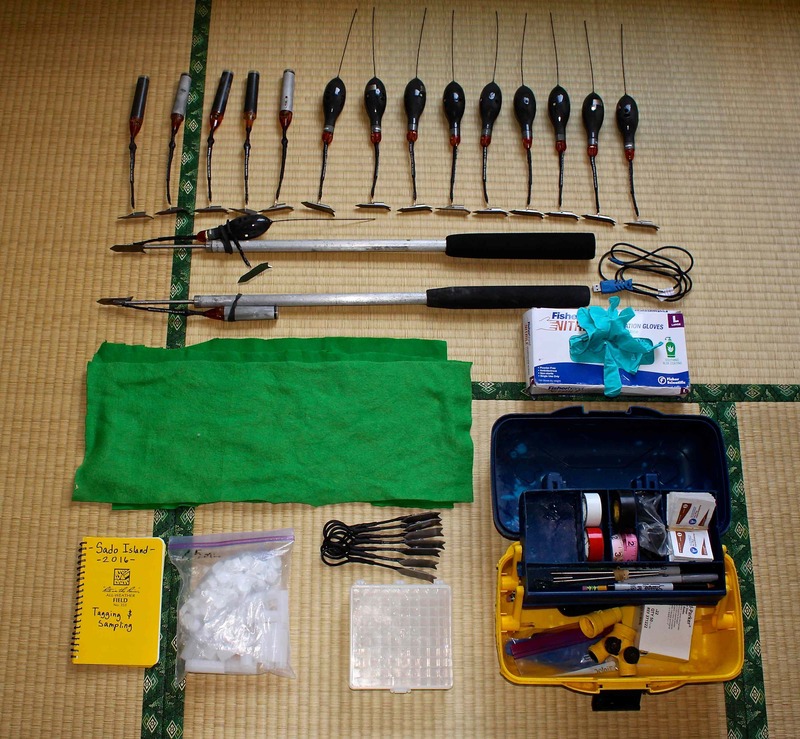 Tags are laid out on a tatami mat, prepped and ready for use when the tagging team heads out to sea. The alarm buzzes beside my head and, opening my eyes, I have no idea where I am. I’m lying on the floor of a room covered wall-to-wall in woven straw mats, with rice paper windows and a table rising a foot off the ground. Right. Japan. Sado Island in the Sea of Japan, where I’m sleeping on a traditional tatami mat. Yesterday’s cannery whistle is blowing back home at the Monterey Bay Aquarium at noon, but my 4 a.m. alarm tells me it’s time to get up and find some Pacific bluefin tuna. One year ago, I sat in a third-floor office at the aquarium with my colleague Chuck Farwell and Dr. Ko Fujioka from Japan’s National Research Institute of Far Seas Fisheries as we went through the steps necessary to deploy a satellite tag on a bluefin tuna. We discussed the tag attachment system that anchors the small electronic device to the animal for up to a year at a time, as well as the process for programming the tag’s onboard computer to record the whereabouts and behaviors of these wide-ranging fish. Pacific bluefin tuna migrate across the ocean, from spawning grounds off Japan to feeding grounds in the Eastern Pacific. This exchange of techniques was the first step in a formal partnership between the Monterey Bay Aquarium and the Japanese government to support collaborative research between our institutions. 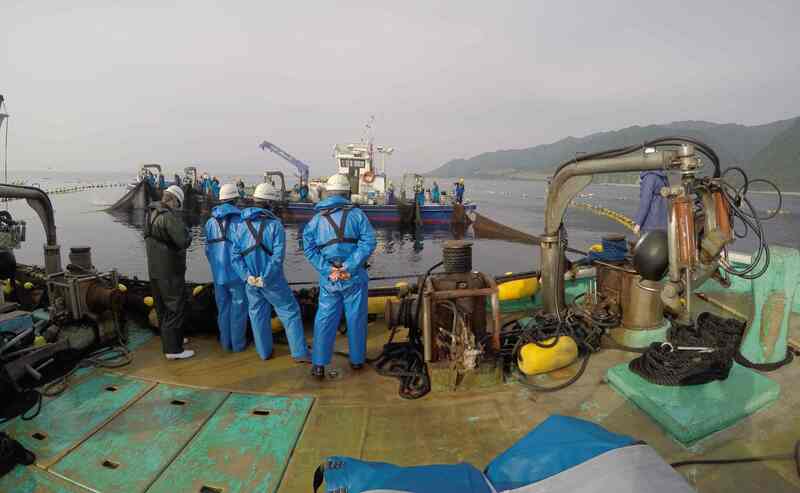 Now we’ve met up again, on a small island between Japan and Korea, to tag large bluefin together. The animals we’re here to study don’t respect national boundaries. Dr. Fujioka has tagged many small (about 6-pound) Pacific bluefin in Japan with electronic tags, and his data show that these young tunas swim 6,000 miles across the Pacific to grow up while feeding in the productive waters of the California Current. Our team at the Tuna Research and Conservation Center has focused on tagging 2- to 3-year-old (about 25-60 pound) bluefin off Southern California, and we’ve found that many swim back to their home waters off Japan. It took me 12 hours and a load of jet fuel to get to Japan. Bluefin can swim au natural across the Pacific in under a month. To sustainably manage bluefin stocks, you need to know how many tuna are out there, a challenging prospect for animals that call the entire North Pacific home. 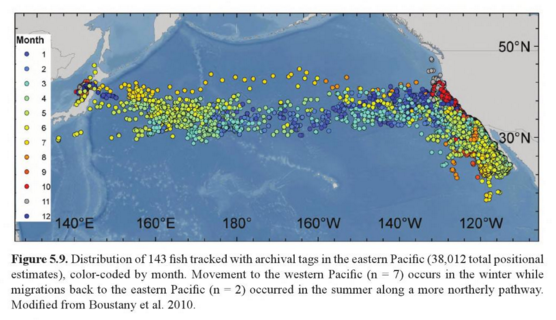 The best way to solve the puzzle is to use electronic tagging technologies to reveal migration routes, exchange rates, and catch rates between the Eastern and Western Pacific. Most importantly, we need to improve the understanding of bluefin spawning habits. These data then can feed into statistical models that determine what a sustainably fishing level for bluefin should be. 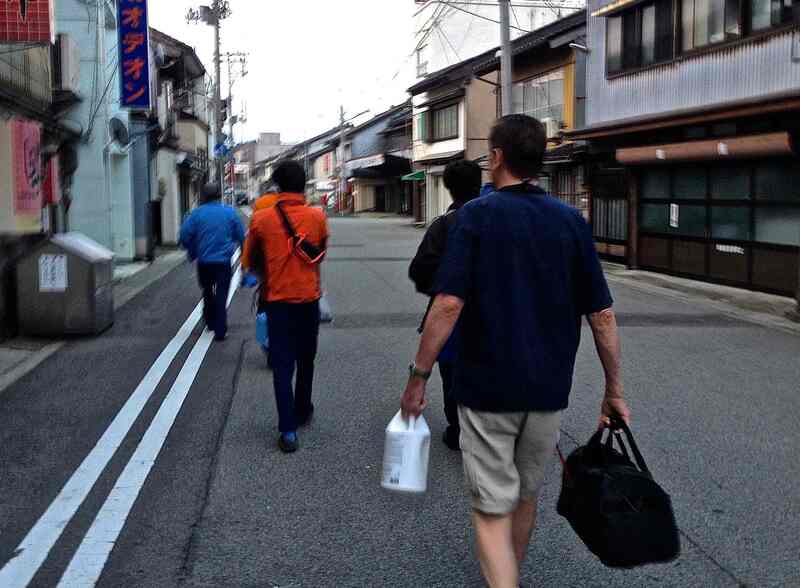 Bluefin tuna tagging team heads to the harbor for their first day at sea in Japan. To reconstruct a complete picture of the natural history of the Pacific bluefin and to inform the management of the international fishery, an East-West research partnership is a must. I rush downstairs from my hotel room and find Chuck, Dr. Fujioka, and a team of researchers from Kendai University waiting in the lobby. We set off down the quiet streets of the fishing village and jump in a van to meet our fishing boat. We head up the winding coastline of Sado Island, passing clusters of traditional Japanese homes and rice paddies. Twenty minutes later we reach a seemingly abandoned harbor and don our foul-weather gear, life jackets, hardhats and boots. We’re triple-checking our equipment when a group of 20 hard-hat-wearing fishermen arrive, and the dock erupts into a flurry of activity. We’re hustled onto a large barge and we’re out to sea. The tagging team waits patiently on deck for their first opportunity to put a tracking tag on a Pacific bluefin tuna. 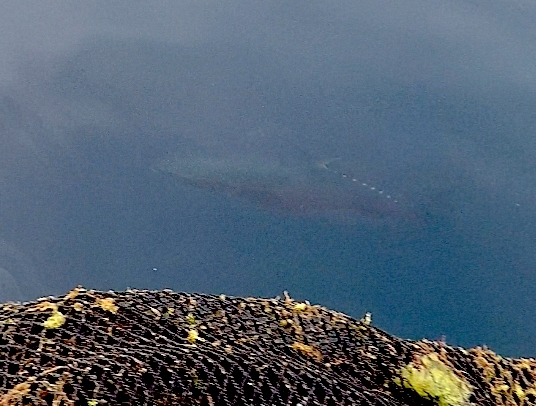 The Sado Island fishing cooperative we’re working with uses a large “set-net” to trap bluefin. Schools of tuna migrating along the coast are channeled via a complex series of net barriers into increasingly smaller net chambers. We’ll check the trap for bluefin each day for the next three weeks. A second vessel arrives, and the crew of fishermen begins the arduous task of hauling in the football-field-sized net by hand, shrinking the size of the chamber with each hoist. I’m pacing the deck in anticipation, then look up as a call is raised: “MAGUROOOOO!” A fisherman has spotted a large bluefin in the trap! It’s a tense atmosphere; over a year of preparation has brought this team together for this moment, and everybody is hoping for success. Tunas are sensitive animals; their eyes are easily damaged through improper handling, and excessive stress from capture can be fatal. Chuck has worked with tuna for 30 years at the aquarium, and around the lab we call him the “Tuna Whisperer.” He’s been training the Japanese team on tuna-handling practices, and we hope that with gentle treatment, good seawater irrigation of the tuna’s gills, and a quick surgical procedure, we will have the tagged bluefin back in the ocean in no time. Skilled Sado Island fishermen wrap their net around a bluefin tuna before it’s brought aboard for tagging. A large dip net attached to a crane swiftly scoops the tuna out of the water and hoists it over to the surgery pad, where Chuck and student Kota Sebe quickly place a seawater hose into the fish’s mouth, simultaneously sliding a cover over its eyes to calm it. Dr. Fujioka moves in and, finding the appropriate location and angle, anchors the electronic tag on the tuna’s back. Ph.D. student Hiroyuki Yamane uses scissors to snip a small piece of fin for genetic tests and runs a measuring tape run along the length of the body: 145 centimeters. That translates to a 130-pound bluefin! One minute later, the eye cover and hose are removed and with an ichi, ni, san (one, two, three), we hoist the tuna up and slide it over the rail. We watch it swim away into the Sea of Japan. With high-fives all around, we’re excited to begin our cross-Pacific bluefin tagging collaboration on such a high note. This first tagged fish is roughly 5 years old, the exact age-class we want to learn more about. We must wait for eight months before the tag automatically detaches from the tuna and floats to the surface, sending back its stored data about the tuna’s travels, the ocean temperatures it favored and its swimming depth. This information will help us uncover the secrets of bluefin tuna spawning and inform sustainable management of this important species. Fujioka, Ko, Masachika Masujima, and Andre M. Boustany. “Horizontal Movements of Pacific Bluefin Tuna.” Biology and Ecology of Bluefin Tuna (2015): 101. Learn more about the Aquarium’s work with Pacific bluefin tuna.